NIDA Deputy Director Wilson Compton, left, and Society for Prevention Research (SPR) President Richard F. Catalano welcomed participants to the 10th Annual NIDA International Poster Session at the 2017 SPR meeting. The 10th Annual NIDA International Poster Session opened the 2017 annual conference of the Society for Prevention Research (SPR), held in Washington, DC. 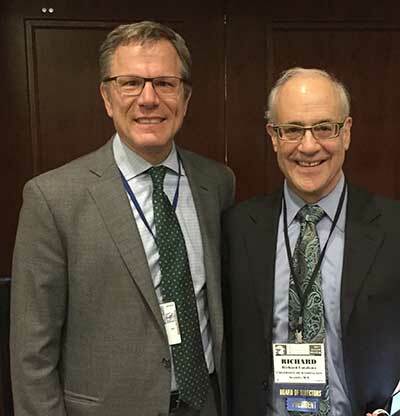 SPR President Richard F. Catalano, Jr., Ph.D., University of Washington, and NIDA Deputy Director Wilson Compton, M.D., M.P.E., welcomed presenters and participants. The international posters highlighted drug and alcohol abuse prevention research featuring U.S. collaborations with prevention researchers from other nations. NIDA provided travel awards to seven researchers: Clarisse Moreira Alo, Arthur de Oliveira Correa, Sheila Giardini Murta, and Luis G. A. Vinha, Brazil; Fabio Bautista-Pérez, El Salvador; Lisa Wegner, South Africa; and Valeriy V. Ryabukha, Ukraine. The poster session was held May 30.